Each season has its fruit temptations, from the jewel-like citrus of winter to the tart rhubarb and tender strawberries of spring; fall mitigates the oncoming darkness with its copious cranberries, apples and pears. In no season, though, do we seem to feel as acute a need to preserve these fleeting offerings of the land as in summer, when we race to can, bottle and jar all the juicy-ripe apricots and peaches, the bulbous black and red berries, and the sweet-tart cherries and plums we can lay our hands on. I’m not quite sure what it is about summer’s produce in particular that inspires such behavior (though my vote goes to the fact that these fruits are simply the year’s most delicious), but preserving fruits is so iconic of summer that it struck me as nearly criminal to realize that as much as I’ve pondered, planned and romanticized the idea, I had never actually done it myself. Then again, it’s not hard to see why. In an age where fruit is flown in from all corners of the globe whatever the season and high-quality preserves on the shelf are a dime a dozen, it certainly isn’t necessary – at least, as long as you don’t live on a farm and have truckloads of ripe fruit which would go to waste otherwise. And then there’s the cost, which for someone relying on markets is no trivial matter. But I also admit to having a certain amount of trepidation where the preserving process itself is concerned, which seems to me just this side of alchemy: carefully-controlled temperatures, specific sugar-fruit-pectin ratios, precise boiling times to achieve the proper consistency… Or maybe it just has to do with my fear of the sealing-in-jars part which if done improperly can result in anything from unsightly mold to quite deadly bacteria. In any case, like preparing live lobsters and making perfect puff pastry, fruit-preserving was filed away with all those things I always planned to conquer someday. Which is why I was as surprised as anyone to find myself last week churning out two batches of fragrant fruit butter. Fruit butter is, as far as I know, a uniquely North American product, and one which unlike other New World exports (e.g. pickled jalapeños, peanut butter and Fluff®) has never made it onto foreign shelves. To be fair, it’s probably not different enough from other types of jams, compotes and conserves to warrant international attention, but I personally like to think of it as occupying its own special little niche in the fruit-preserve taxonomy. So what exactly is it? It is not, as you may be surmising if you’ve never come across it before, a mixture of fruit and dairy fat. It is simply sweetened, pureed fruit – any fruit, in fact, although apple butter is by far the most common and the most traditional. Invented by the Pennsylvania Dutch, who arrived on American shores in the eighteenth century, apple butter was originally used as a method for preserving the fall harvest (it has excellent keeping qualities due to its low water content) and was made by boiling apples with cider until they reduced to an intense, caramelly puree. I don’t know whether spices were present in this proto-butter or not, but these days just about every jar of apple butter has them, usually cinnamon, cloves and other rich, wintry aromatics. Apart from that, the most telltale signs that you are dealing with a butter and not a jam or conserve are that it is considerably less sweet, while the flavor is more intense and the texture thicker, smoother and more substantial. Although I have always been a fan of the original, what got me thinking outside the spiced-apple box was in fact a gift sent to me from Montreal by the lovely AJ and Michelle of one of my favorite blogs, an endless banquet. Among the mouthwatering treasures they sent was a delicate, hand-labeled jar of Michelle’s pear-vanilla-bourbon butter, an ingenious concoction she has been selling to great acclaim at local Montreal markets. I was so smitten with this silky, not-too-sweet yet robust marriage of flavors (and not living close enough to Montreal to get a regular fix from Michelle’s supplies) that I started thinking about how I could play with this idea myself, combining fruit purees and aromatics in unexpected ways, and before I knew it I was simmering, straining, and jarring the results. And wouldn’t you know it, after all my years of hesitation, I couldn’t believe how little effort is actually required to capture these fleeting tastes of summer, how flexible the recipes are, and how endless the possibilities. Not to mention how spectacular the results. The only part I haven’t figured out is how to make sure these delicious butters survive more than a week or two in my cupboard, since in none of the recipes I consulted do they tell you how to preserve your self-restraint. p.s. I’d love to know: What do you preserve and how? There is something so rustic and honest about fruit butters, and excellent results can be had without any need to fret over temperatures, ratios and weights, as just about any puree that is sweetened to your liking and cooked until thick enough to mound on a spoon will fit the bill. Of course I would encourage you to can yourself a jar or three, but even if you’re not ready to take the canning leap, these recipes make small batches which will survive happily in a closed container in your fridge for a few weeks. But if you want to learn more about canning, this is a good place to start. Oh, and in case you’re wondering, fruit butters are excellent spread thickly on toast, swirled into yogurt and used just about anywhere you’d use jam. Yield: Both of these recipes will yield about 3 cups of butter; the recipes can easily be increased for larger quantities. Bring a large pot of water to a rolling boil. Blanch the peaches by submerging them (in batches, if necessary) for 1 minute and then transferring them to a bowl of ice water. When cool, peel, pit and slice them. Combine them with the sugar in a large bowl, and let macerate at room temperature for a couple of hours, during which time the peaches should give up a lot of juice. Strain the peaches, reserving the juice. Place the juice, the sliced lemongrass and 1 cup water in a heavy-bottomed pot and bring to a boil over medium-high heat. Reduce the heat slightly and let simmer until you have a thick, fragrant syrup, about 30 minutes. Strain the syrup, discarding the lemongrass. Return the syrup to the pot and stir in the peaches. Simmer over medium-low heat until the peaches are completely soft, about 20-25 minutes. Remove from the heat and puree, either in a blender or with an immersion (stick) blender. Return to the pot and stir in the lemon juice. Cook over low heat, stirring frequently to prevent scorching, until the puree thickens to the consistency of applesauce, about half an hour. Taste the mixture and add more sugar or lemon juice as desired. Remove from the heat and transfer to a closed container (or, if you’re comfortable with canning, fill into jars and process in your normal way). If not canning, refrigerate immediately and consume within a couple of weeks. Combine the blueberries, apple, and sugar in a large bowl, coarsely crushing some of the blueberries, and let macerate at room temperature for a couple of hours. The blueberries should give up a lot of juice. Transfer to a heavy-bottomed pot and bring to a boil over medium-high. Turn down the heat and let simmer until the fruits are completely soft, about 25 minutes. Remove from the heat and puree, either in a blender or with an immersion (stick) blender. Return to the pot and stir in the lavender and lemon juice. Cook over low heat, stirring frequently to prevent scorching, until the puree thickens to the consistency of applesauce, about half an hour (the exact time will depend on the water content of your blueberries). Taste the mixture and add more sugar or lemon juice as desired. Remove from the heat, force the mixture through a sieve while still hot, and transfer to a closed container (or, if you’re comfortable with canning, fill into jars and process in your normal way). If not canning, refrigerate immediately and consume within a couple of weeks. Mmmm…I know what I’m doing this weekend. oh my goodness the blueberry lavender butter sounds so good! my lavender has been in my pantry getting bored since i made my lavender-lemon shortbread cookies so long ago. now i can put them to some good use. thanks for the recipe! I’ve been making small batch jam and conserves and a few kinds of brandied fruits for a couple of years now, but I haven’t tried fruit butters yet. I am a plum fanatic, as you may have noticed, so I think I might try a plum butter first…probably with some gewurztraminer (sp?) and vanilla, because that seemed a good combination with some jam I did. Or maybe apricots?You’ve given me a lot to think about here. Last year I made some very excellent apple butter in my crockpot. Unsure of how to can it I froze it in batches and just thaw some when the jar in the refrigerator runs out. I have great plans each year for canning and preserving but the only one that consistantly gets tried is hot pickled dill bean. I finally perfected the recipe last year but only did one batch :(. take a standard recipe for dilly beans and up the red pepper flakes, add cayanne pepper and an extra clove of garlic or 2. Sounds delicious.My better efforts so far have been in the jam making department-fig and bayleaf, strawberry and ginger,cape gooseberry and lime.I am very tempted to try a chickoo butter or a guava butter after reading your post. Melissa,I loved your point about our need to preserve the fruits of summer. Even though I live in a large city where I can find any number of preserves from all over the world, come summer I feel this deep-seeded need to preserve preserve preserve! I am particularly intrigued by the blueberry lavender butter. Glad to hear that you’ve been in touch with AJ and Michelle of An Endless Banquet. I can only imagine how wonderful their butter was. Melissa, these look so glorious. And I have lots of blueberries and peaches from the Greenmarket in my fridge even as we speak. They are intended for pie, which is, I think, where they’re going to end up, since I have neither lemongrass nor culinary lavendar at hand. But I want to try these butters. Last weekend I made a fair-sized batch (10 jars) of apricot curd, which I blogged about last summer. This year I used lime juice instead of lemon, kept the sugar down, and used a much higher ratio of apricots to butter/eggs, which made it somewhat runnier, but much more fruit-intense. I don’t can it, since it has dairy stuff in it, but it’s fridge safe for a month and freezer safe for a long time. Hi Melissa,Well, needless to say, we were thrilled to see that Michelle’s pear-vanilla-bourbon butter was such an inspiration. We’re pretty new to the fruit butters game ourselves. Things picked up last summer after we attended a workshop given by June Taylor in Napa. Her conserves–including fruit butters–truly were a revelation.When I came across your post on Friday night I called Michelle at the restaurant right in the middle of their late-evening rush to tell her the good news and read her your post over the phone. Customers? What customers? Lemon and passionfruit butters are some of the most popular sellers at most church fetes in Australia. I love making lemon butter – eggs, sugar, butter and lemon juice. There is a great recipe in Stephanie Alexander’s Cook’s Companion which I use all the time. 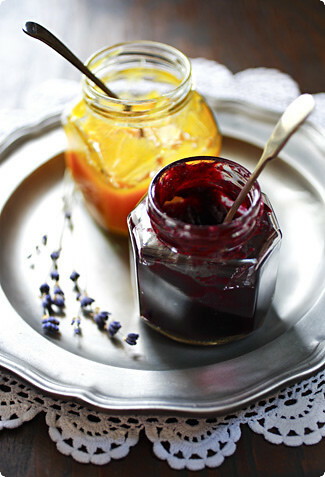 Hi Melissa – I’m not a big fan of jams normally but fell in love with your beautiful creations, what lovely combinations! These look delicious! Anything with White Peaches is to die for. Great combo’s! Wow, these look delicious!I am on a preserving tear this year–lemon marmelade in the winter, since then strawberry jam and pickles. I find it addictive, and the feeling of having created something enduring and tasty is so rewarding. Looking forward to more fruit jams–and now fruit butters! Thanks for the inspiration. Good idea to do fruit butters instead of jams! Blueberries are my favorite and I am loving all the lavender I’ve seen in cooking lately. What a great combo! You are right Melissa, fruit butter is an American thing. Or at least I had never heard about it before. I love the idea of preserving fruit or even food actually, as I grew up doing so in the summers spent at home. And I love the smell, the process, everything about it. YOUR preserves are gorgeous and I am pleased to see you tried your crafted hand at them! One of the these days, you are going to have to open a mail-order store so all of us hungry food bloggers can order these delicious goodies from you (and then gush about them on the Internet of course). These sound yummy. And S and I love the photo! Where did you get that great tray? Love your blog Melissa. I have been a committed preserve maker ever since I was pregnant with my second child (instead of a desire to clean I had a desire to make preserves) and by the time he arrived I had a pantry full of nectarine chutney, raspberry jam, strawberry jam and marmelade. My recent favourite is raspberry and rhubarb jam which is a divine combination, roughly half and half quantities of the fruit, but it depends what I or my mother has available. Thanks for your background details about fruitbutters. I work in a nice little lunchroom called "Proef" (meaning "taste" but also "experiment") in the Netherlands, and we serve a wonderfull dish named "lost sheep", it’s sheepcheese withhomemade pearbutter with cardemon and prunebutter with cinnemon.Both of the butters combine really well with the sheep cheese, but the pear/cardemon combination is especially addictive.Is it common to serve fruitbutters with cheese? Or are they used like a regular jam?